ALDER, COMMON (Alnus glutinosa). Hedging Plants, Trees, Shrubs and Conifers. A fast growing, deciduous native plant with shiny leaves, producing yellow catkins in March and attractive false cones, which provide a good supply of bird food in spring. Ideal for very wet situations, and is useful for preventing soil erosion. This variety is particularly useful where rabbits or stock could damage the bark as it is rarely eaten by them. Due to growing conditions in 2018 the 125-150cm plants are around 100-125cm tall. HEDGE Trim July or August. 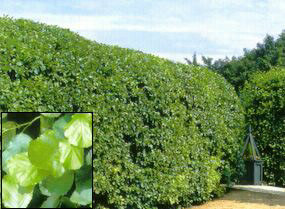 For hedges 6ft (1.8m) or more. Plant 2ft (60cm) apart. TREE 30ft x 12ft (9m x 3.7m) in 20 years, ultimate height 70ft (20m).